Oh, this shop has it all! 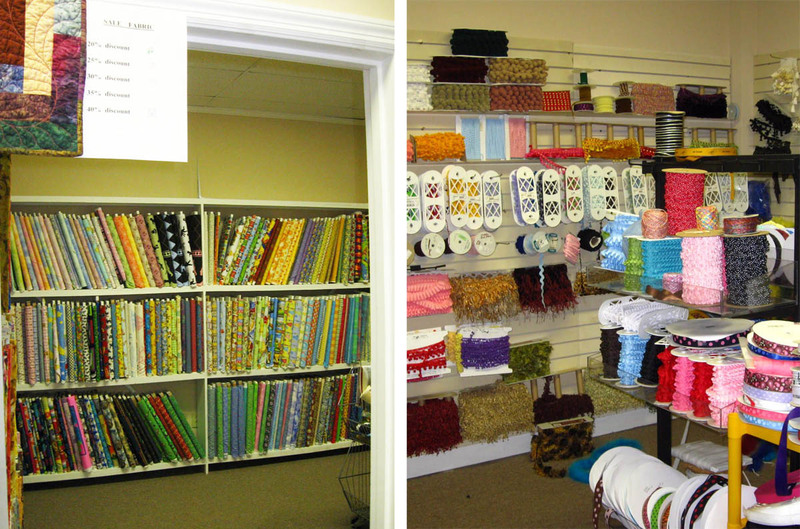 Lebanon Vacuum and Sewing Center is about 30 miles east of Nashville in Lebanon, Tennessee, and veteran quilt shop owner, Jan Franklin, has been running the shop for over 20 years. 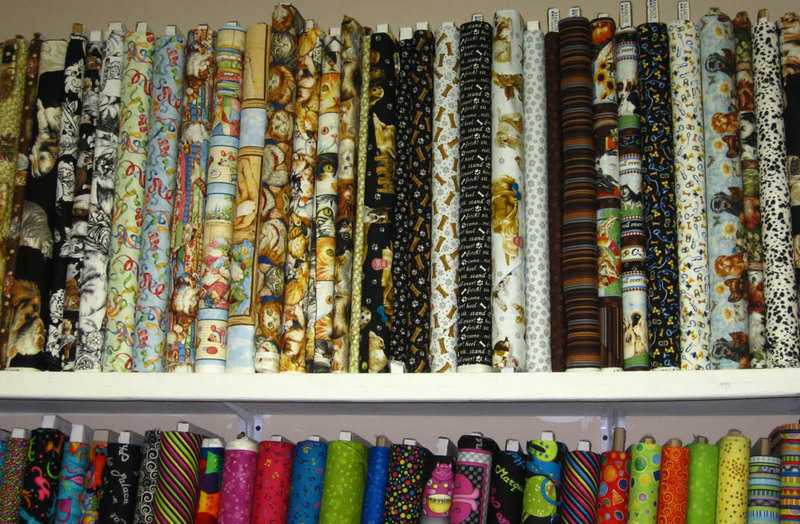 So, with her vast experience in sewing, quilting, the operation and instruction on the use of Brother and Janome sewing machines, she is a wealth of knowledge and can field any question that comes her way. 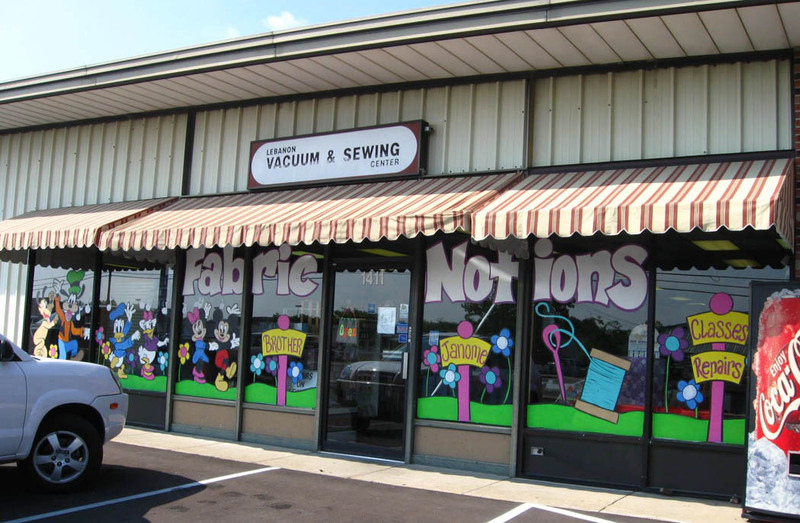 Lebanon Vacuum and Sewing Center, Lebanon, Tennessee. 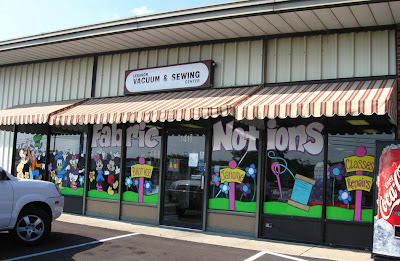 You can tell by the cartoon characters and oversized sewing notions painted on the store's front windows that this is a fun place. It gets even better once you're inside. 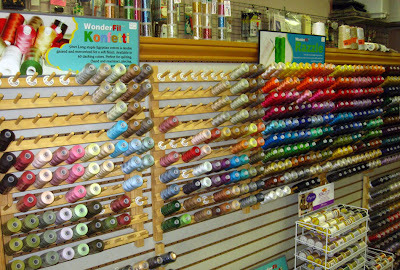 The first room has the Janome and Brother sewing machines as well as threads (including Wonderfil, one of my favoritess! 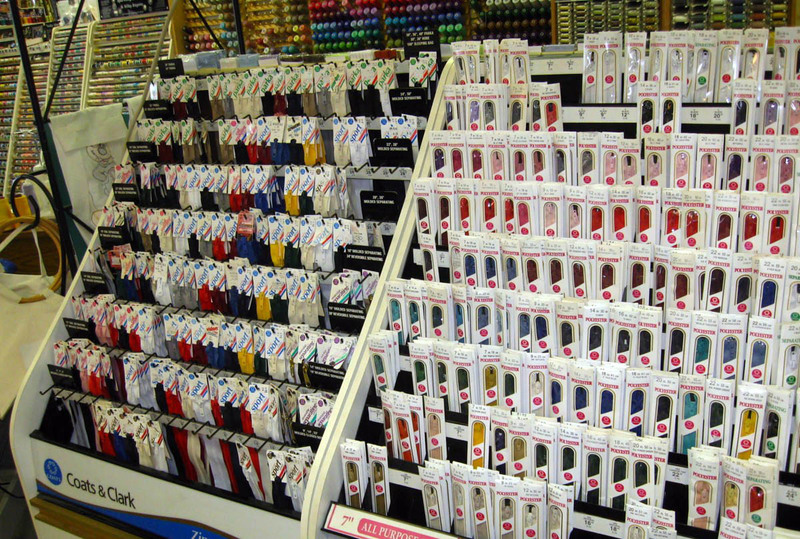 ), zippers and other sewing notions. 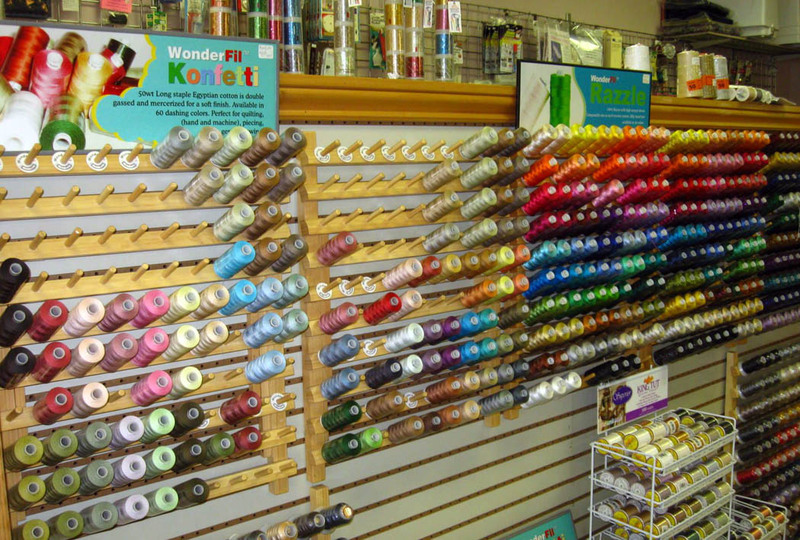 Wonderfil Konfetti and Razzle threads. 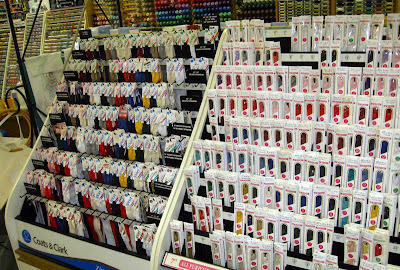 Zippers with more threads in the background. 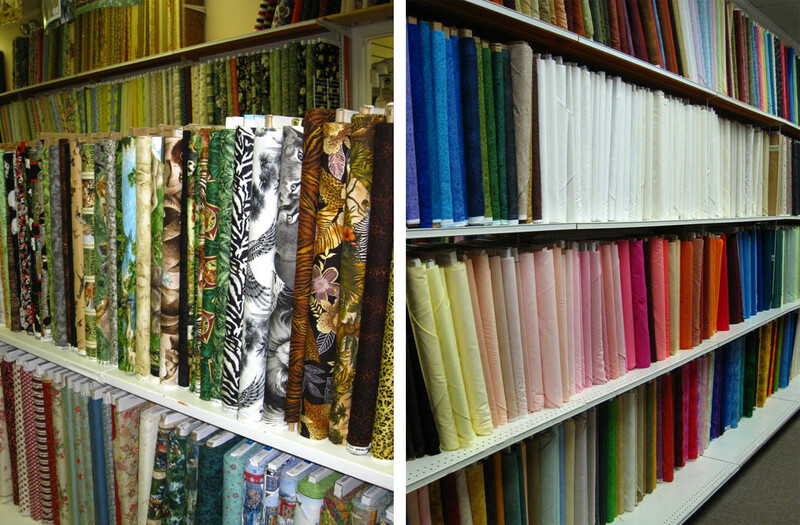 A room with a huge selection of fabrics. 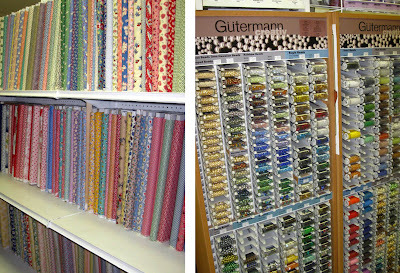 20s ad 30s prints (left) and a wonderful assortment of beads (right). 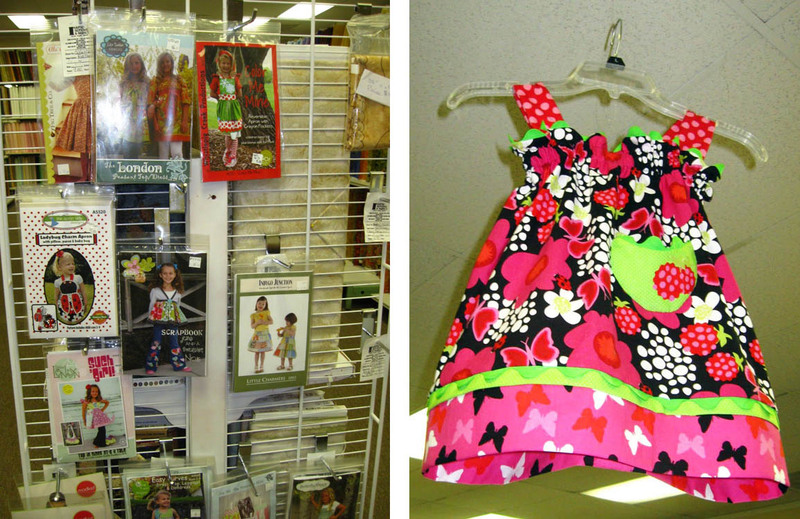 animal prints, safari themes, music and a wide selection of solids. Jan carries an amazing selection of themed prints. 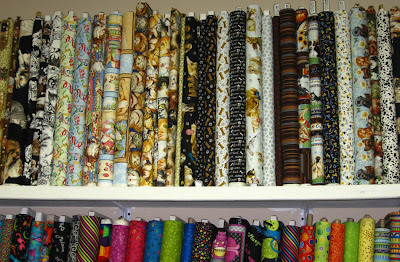 For the pet lovers, there is a shelf full of dog (Man's Best Friend) and cat fabrics. For the dog and cat lovers, including paw prints and dog biscuits. 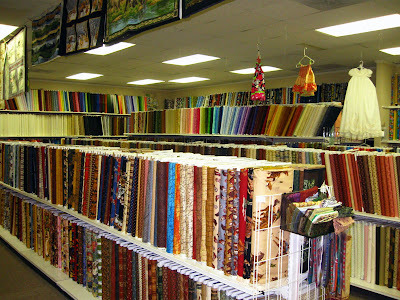 The sports fans are well represented with team fabrics. 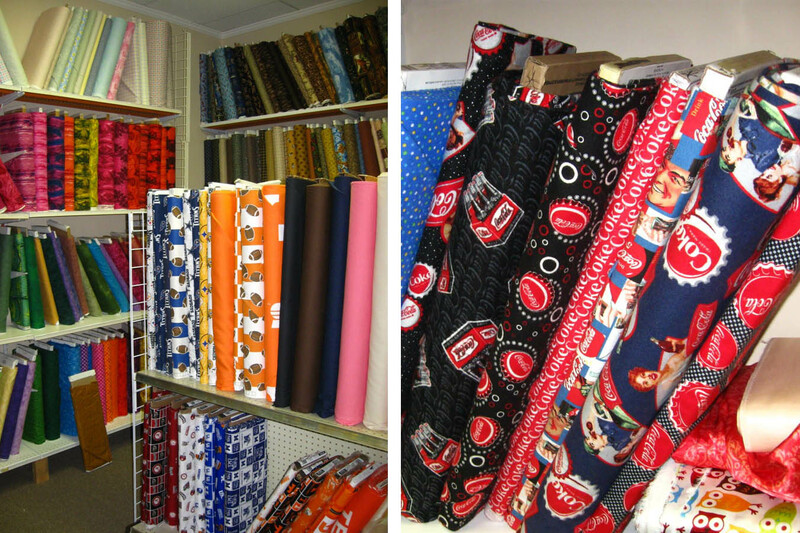 There is even several Coca-Cola fabrics. Sports team fabrics and Coca-Cola prints. 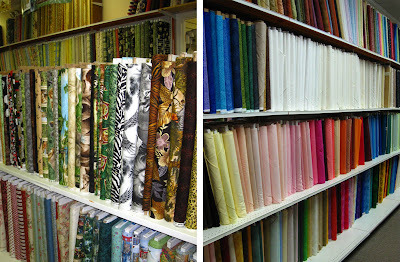 Check out the other rooms adjacent to the main fabric room... one dedicated to sale fabrics and one to trims. A room of sale fabrics and a room of trims. There is a room for books and magazines. 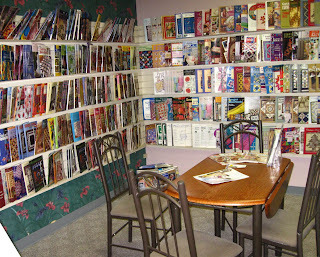 The reading room full of quilting and sewing books and publications. 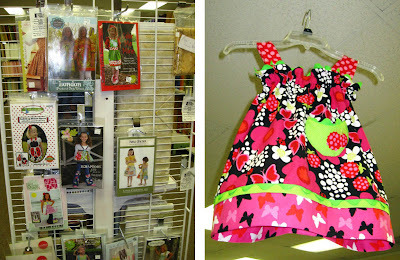 Darling samples of children's clothing hang from the ceiling. This quilt hangs over one of the doorways. Check out the detail and the quilting. 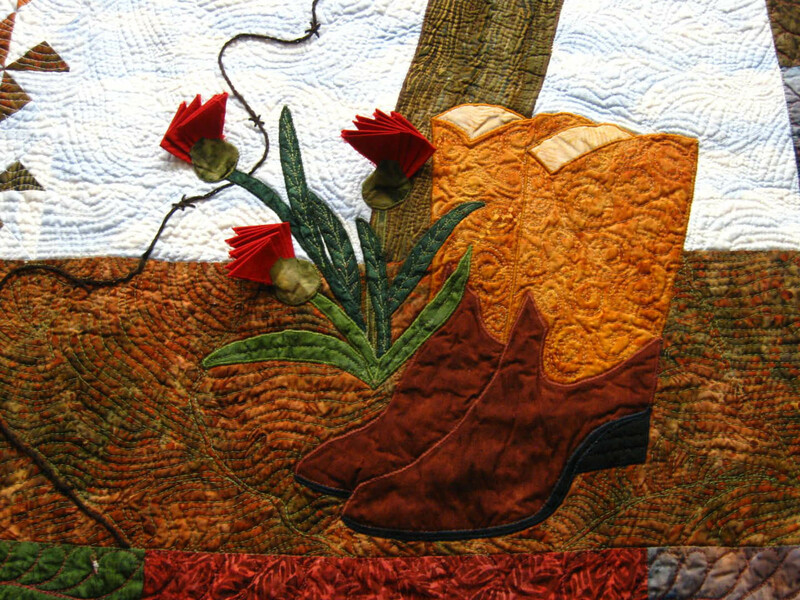 Detail of the 3-dimentional appliqué and machine quilting. As with many quilters, Jan and her staff have huge hearts. 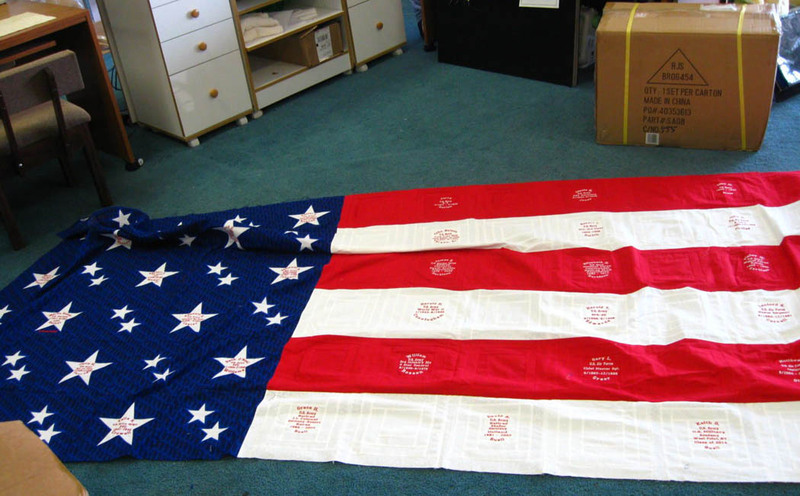 Jan and one of her employees are making a Quilt of Valor for an upcoming fair exhibit and fundraiser. The red and white stripes are comprised of log cabin blocks. Names of local men and women who have served in the military are embroidered on the stripes as well as in the stars. 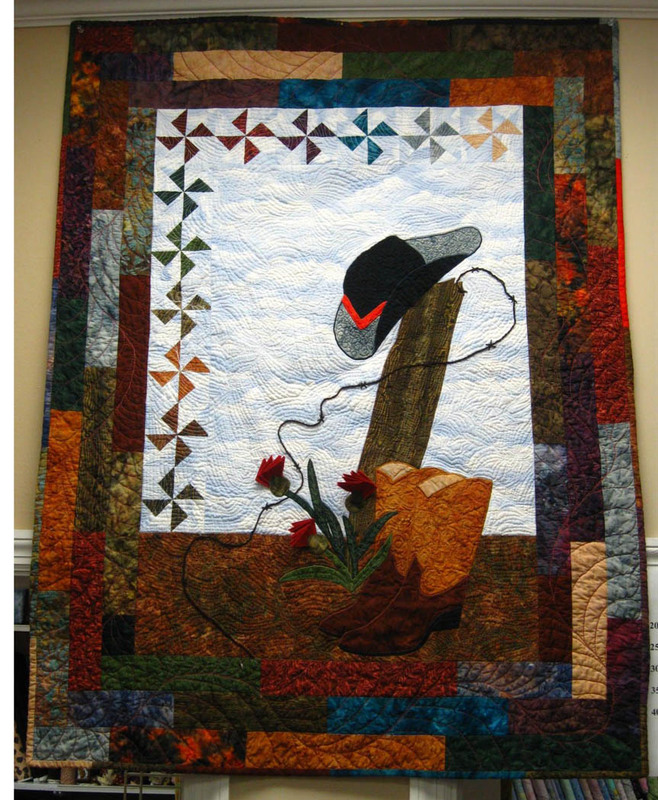 A Quilt of Valor is being pieced and embroidered by Jan and her staff. The finished size will be around 110" x 150". 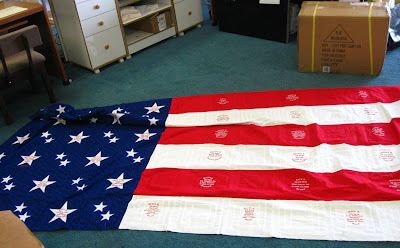 This is quite a big undertaking and the embroidery work is amazing! 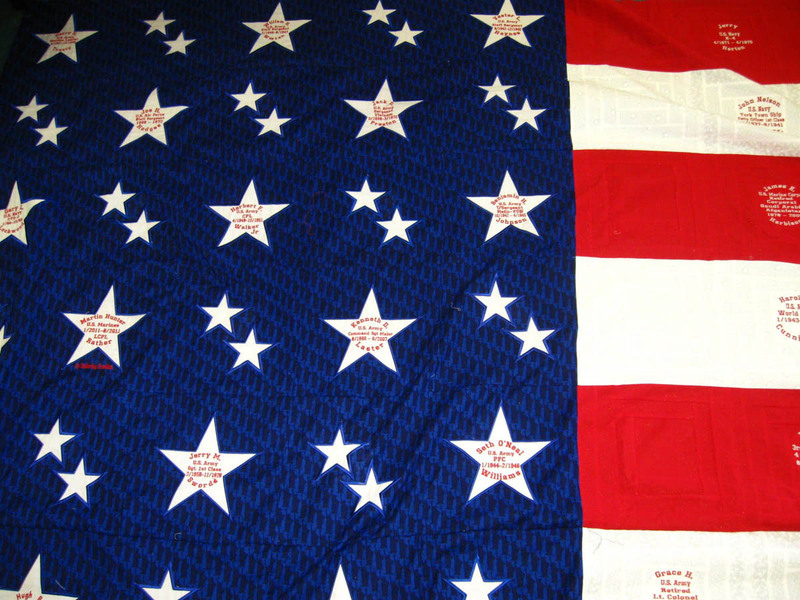 Detail of embroidered names in the stars on this Quilt of Valor. 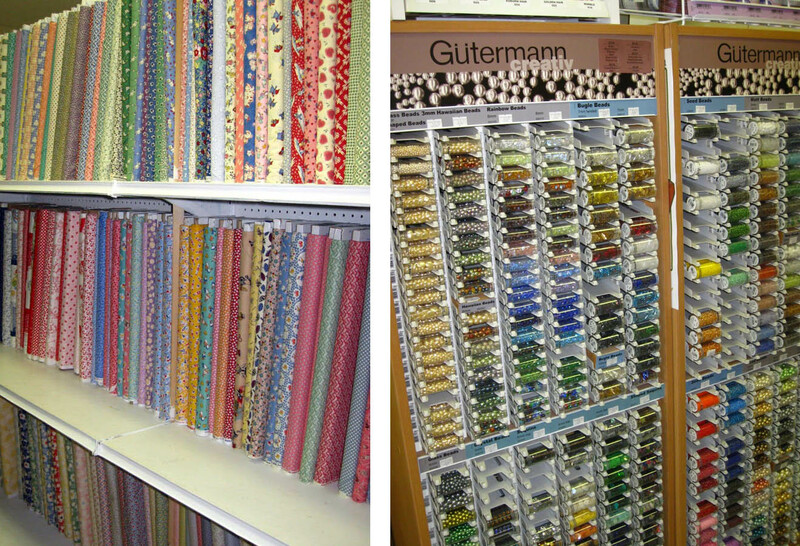 Generous quilters, like Jan and her staff, who give so freely of their time, talent and resources surely get extra points in heaven!